But don’t take my word for it. Take the readers of Phoenix New Times “Best of Phoenix” 2012 issue who just voted Pittsburgh Willy’s as the “Best Hot Dog Joint In Town!” Pittsburgh Willy’s is famous for their gourmet hog dogs cooked up fresh everyday with lots of one of a kind foods – all with a Pittsburgh touch! Gourmet hot dogs with a wide variety of fixins’! When Randy Walters, owner of Pittsburgh Willy’s, signed up to participate in Eat Your Art Out Chandler for the second year, we asked him a few questions about why he decided to start his own restaurant. Q: Why did you decide to get into the food industry? A: My dad had a hamburger/hot dog joint in the 1940’s. He lost the restaurant during the war. I was born much later but always heard about it and always wanted a hot dog joint! Q: Why are you participating in Eat Your Art Out Chandler? A: I am blessed to be doing what I love every day and my success depends entirely on the support of local customers….it is an honor to give back and support the local Chandler arts. Q: Why support the arts in Chandler? Q:Why has your business been successful? A: It takes folks back to simpler times, where a family can come in, relax and enjoy amazing customer service along with fresh made foods and delicious gourmet hot dogs n’ sammiches. My customers are family and they will feel the local commitment to the Chandler community and what makes doing business in Chandler like spending time with family. A: Step back to simpler times where you will feel like you’re eating at a friend’s home. From the outstanding customer service to the quality of food, you will experience what a “family joint” is like in Pittsburgh…without leaving friendly Chandler! 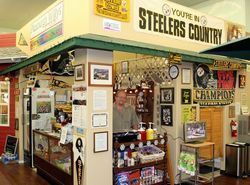 From our amazing homemade no bean chili and pierogies to our many gourmet hot dogs and sammiches, PittsburghWilly’s promises that you will leave our joint well fed and eager to return! Pittsburgh Willy’s is donating 50% of their proceeds between 11am-3pm to the Center’s fundraising event, Eat Your Art Out Chandler on Tuesday, February 26 ! Monday Mashup: Sleeping Beauty and a food drive. I am constantly surprised at the inherent goodness in people. With only a few days heads up, people were more than willing to donate food to help their neighbors in Chandler. I’m not talking about a three year old can of strained peas, but cases and cases of food that people were willing to give up to help someone they may not know. You guys are amazing. If I could, I’d high-five every one of you that helped out (but that might take days). Sleeping Beauty was wonderful, but what else could you expect from Ballet Etudes? They were able to turn a timeless classic into a modern masterpiece, all with local talent. Plus, it didn’t feel like a traditional ballet, in the sense that it was a formal event. It was fun, even for people who would rather watch something other than dancing. The next Ballet Etudes performance at CCA will be The Nutcracker, but that doesn’t mean you have to wait six months before you can see them again. Check out their website and see if they are doing any performances that you might be interested. Back in the day, it seems like ballet was something that only a select few people enjoyed. Movies show it as people dressing up in formal wear and calling everying “Daaaaahling” with a British accent. Now, more and more people are going to, and enjoying, ballet. Just look at how well the movie Swan Lake did. Yeah it didn’t hurt that it had Natalie Portman going bonkers on stage, but people come away talking about the actual ballet too. Sleeping Beauty, The Nutcracker and Swan Lake are all by Tchaikovsky*, so if you like one then it stands to reason that you’ll love them all. Plus, Sleeping Beauty is performed by people who are actually from Arizona. The lead is an amazing 17 year old from Gilbert, rather than someone from New York or LA who flys in and performs, then books it out of town. We have such an amazing array of talent in Phoenix, and I’m so glad that everyone is getting to see just how great our performers are. So come out and support the local talent, and while you’re at it, bring some non-perishable food and help out Chandler. Usually when I blog, I try to add in some humor or sassy comment to keep you engaged, but I don’t think I can do that today. Yesterday we announced that we would be participating in the City of Chandler’s food drive and offering anyone who dropped off food during Sleeping Beauty a chance to win two tickets to see The Nutcracker. Even if you don’t like ballet, please give us a hand, and drop off some non-perishable food that you’ve had in your pantry but don’t plan on eating. Trust me, we’ll find someone who wants it. I’ve known plenty of people in these situations, and they aren’t looking for a hand out, but a way out. If accepting help from the food bank means that all bills are paid in full and they can start getting ahead, then that’s what has to be done. But with more and more people needing help, there is enormous strain on the food banks to help people improve their situations. Plus, school is almost out. For some kids, that means that the assurance of two meals a day (free or reduced breakfast and lunch) is going away for a few months, so the food banks will have to step in and help make sure these kids get the nutrition they need to start school in the fall healthy and ready to learn. This is where we come in. If you happen to be anywhere in Chandler and know that you can drop off a pack of juice boxes or a box of granola, please do so. Here is a list of places that you can drop off food, including CCA. Of course, we’d love to see you this weekend at Sleeping Beauty so you can enter the raffle, but really, we just hope to see the community step in and help their neighbors.